Parkersburg, located at the confluence of the Ohio and Little Kanawha rivers, is the third-largest city in the State of West Virginia. It is the county seat of Wood County and the largest city in the Parkersburg–Marietta–Vienna Metropolitan Statistical Area. The population was 31,492 at the 2010 census. Its peak of population was more than 44,000 in 1960. The city is about 14 miles south of Marietta, Ohio. The Baltimore and Ohio Railroad reached Parkersburg in 1857, but lacked a crossing over the Ohio River until after the American Civil War. When the B&O completed the Parkersburg Bridge (CSX) 1868-1870 to Belpre, it was the longest railroad bridge in the world. White settlers originally named the city Newport when they settled it in the late 18th century following the American Revolutionary War. This was part of a westward migration of settlers from parts of Virginia to the east, closer to the Atlantic Ocean. A town section was laid out on land granted to Alexander Parker for his Revolutionary War service. Virginia made grants of land to veterans for their war service. The title conflicts between Parker and the city planners of Newport were settled in 1809 in favor of his heirs. The town was renamed Parkersburg in 1810. It was chartered by the Virginia General Assembly in 1820. It was rechartered as a city in 1860. The town was the terminus of the Staunton-Parkersburg Turnpike and the Northwestern Turnpike. In 1857 the Baltimore and Ohio Railroad built a branch line south to the town from Wheeling, West Virginia. Travelers wanting to connect with the Ohio Marietta and Cincinnati Railroad, one of the east-west lines along the Ohio River, had to take a steamboat 14 miles north to Marietta, Ohio. Jacob Linville designed the railroad bridge planned by the B&O. It was constructed in 1868–1870 between Parkersburg and Belpre, Ohio, as part of the B&O's main line from Baltimore to St. Louis, Missouri. This drew traffic and trade from Marietta. Today the structure is known as the Parkersburg Bridge (CSX). The climate in this area is characterized by relatively high temperatures and evenly distributed precipitation throughout the year. According to the Köppen Climate Classification system, Parkersburg has a Humid subtropical climate, abbreviated "Cfa" on climate maps. As of the census of 2010, there were 31,492 people, 13,807 households, and 8,086 families residing in the city. The population density was 2,664.3 inhabitants per square mile (1,028.7 /km2). There were 15,562 housing units at an average density of 1,316.6 per square mile (508.3 /km2). The racial makeup of the city was 94.9% White, 2.0% African American, 0.3% Native American, 0.4% Asian, 0.1% Pacific Islander, 0.3% from other races, and 2.1% from two or more races. Hispanic or Latino of any race were 1.2% of the population. In the city the population was spread out with 21.2% under the age of 18, 9.1% from 18 to 24, 27.1% from 25 to 44, 23.7% from 45 to 64, and 18.9% who were 65 years of age or older. The median age was 40 years. For every 100 females there were 87.6 males. For every 100 females age 18 and over, there were 83.9 males. The Wood County Ravens, a semi-professional football team, is based in the city. The Ravens are a part of the Mountain State Football League. Parkersburg was home to the Ohio Valley Redcoats, a minor league baseball team, until 1998. The city is in negotiations to bring professional baseball back to Parkersburg. "We don't have a lot of people, nor any professional sports teams, but here is a stat for you. AAA is the highest level that a high school can compete at in W.Va. Both schools mentioned hereafter are AAA schools. In Parkersburg, we have accumulated 192 overall state championships in 103 years with 183 if those coming since 1950. Parkersburg High School alone has 137 championships in its 103 years of existence. There is also another AAA school in Parkersburg called Parkersburg South High School, who, by the way, has 38 titles in 40 years. Not to be outdone Parkersburg Catholic, a single A school, has 17 state titles of its own. Not bad considering that there are 136 high school teams in West Virginia with 38 in AAA. We may not have a pro sports team, but in high school sports, Parkersburg as a whole is pretty dominant" as written in an article on espn.com. Parkersburg is the home of the Parkersburg South High School Patriots, Parkersburg High School Big Reds, and the Parkersburg Catholic High School Crusaders. Middle schools include Van Devender, Edison, and Hamilton. Jackson Middle School is located in Vienna although it has a Parkersburg mailing address. Blennerhassett Junior High School is adopting the "middle school" designation. The Parkersburg News and Parkersburg Sentinel were the city's two major daily newspapers until 2009 when they combined to form one daily edition, The Parkersburg News and Sentinel. The same company also publishes the Marietta A.M. and Graffiti, West Virginia's alternative news magazine. There are many radio stations broadcasting from Parkersburg, including 106.1 Z106 (WRZZ),102.1 The River (WRVB), U.S. 107 WNUS, MIX 100 (WDMX), V96.9 (WVVV), WXIL, Froggy 99.1, and 103.1 The Bear. WTAP, the local NBC affiliate, is the main local television station. Parkersburg is served by Mid-Ohio Valley Regional Airport, with three flights a day Monday through Friday from Washington Dulles International Airport. Parkersburg is served by two major routes, Interstate 77 and US 50. Other routes through the city include WV 2, WV 14, WV 47, WV 68, WV 95, and WV 618. The city was featured in a 1989 episode of Rescue 911. ^ "Parkersburg Weather Averages". Weatherbase. http://www.weatherbase.com/weather/weather.php3?s=372427&cityname=Parkersburg-West-Virginia. Retrieved February 3, 2014. ^ "WMO Climate Normals for Parkersburg/WSO WV 1961–1990". National Oceanic and Atmospheric Administration. ftp://ftp.atdd.noaa.gov/pub/GCOS/WMO-Normals/TABLES/REG_IV/US/GROUP3/00466859.TXT. Retrieved February 3, 2014. ^ "Mid-Ohio Valley Multi-Cultural Festival". Mid-Ohio Valley Multi-Cultural Festivalmerce. http://www.movmcf.org/. Retrieved June 7, 2014. ^ "annual mid-ohio valley multi-cultural festival". West Virginia Department of Commerce. http://www.wvcommerce.org/travel/travelplanner/event/Annual_Mid-Ohio_Valley_Multi-Cultural_Festival/4265/default.aspx. Retrieved June 7, 2014. ^ "parkersburg homecoming festival". West Virginia Department of Commerce. http://www.wvcommerce.org/travel/travelplanner/event/Parkersburg_Homecoming_Festival/10302/default.aspx. Retrieved June 7, 2014. ^ "Parkersburg Homecoming Festiva". Parkersburg Homecoming Festival. http://parkersburg-homecoming.com/. Retrieved June 7, 2014. ^ "The Blennerhassett Museum of Regional History". The Blennerhassett Museum of Regional History. http://www.blennerhassettislandstatepark.com/museum.html. Retrieved June 7, 2014. ^ "Oil and Gas Museum". Oil and Gas Museumy. http://oilandgasmuseum.com/Pages/oilandgashome.html. Retrieved June 7, 2014. ^ "The Parkersburg Nostalgic Gazette". Blennerhassett Island Historical State Park accessdate= June 7, 2014. http://www.blennerhassettislandstatepark.com/. ^ "Blennerhassett Island Historical State Park". Blennerhassett Island Historical State Park accessdate= June 7, 2014. http://www.blennerhassettislandstatepark.com/. ^ "Walt Barnes". Pro-Football-Reference.com. http://www.pro-football-reference.com/players/B/BarnWa00.htm. Retrieved June 7, 2014. ^ a b c d e f g h i j "Parkersburg, West Virginia". City-Data.com. 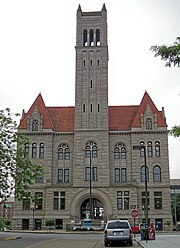 http://www.city-data.com/city/Parkersburg-West-Virginia.html. Retrieved June 7, 2014. ^ Dawson, Jim and Propes, Steve Propes (2003). 45 Rpm: The History, Heroes and Villains of a Pop Music Revolution. Hal Leonard Corporation. p. 170. http://books.google.com/books?id=AiA-6xfdqC0C&pg=PA169&lpg=PA169&dq=Jim+Dawson+parkersburg+wv&source=bl&ots=YpilgYbi7d&sig=7LtTJi2ebWnpOOQt2hK-IkuRJdc&hl=en&sa=X&ei=h1qTU_4i04aqBoKKgOgJ&ved=0CEsQ6AEwBQ#v=onepage&q=Jim%20Dawson%20parkersburg%20wv&f=false. Retrieved 7 June 2014. ^ Onofrio, Jan (1999). West Virginia Biographical Dictionary. North American Book Dist LLC. p. 72. http://books.google.com/books?id=VkkKcEPkp98C&pg=PA71&lpg=PA71&dq=Edmund+Burke+Fairfield++Parkersburg,+West+Virginia&source=bl&ots=wnK-ppy4M2&sig=6WMatR1f7-xvzijRmi4AjTzhW2U&hl=en&sa=X&ei=xPyRU6LePIyTqAbjh4KoAg&ved=0CEEQ6AEwBA#v=onepage&q=Edmund%20Burke%20Fairfield%20%20Parkersburg%2C%20West%20Virginia&f=false. Retrieved 6 June 2014. ^ "WV town helps sister city in tornado recovery". June 1, 2008. http://www.wvablue.com/showDiary.do?diaryId=2370. Chisholm, Hugh, ed (1911). "Parkersburg". Encyclopædia Britannica (11th ed.). Cambridge University Press. This page uses content from the English language Wikipedia. The original content was at Parkersburg, West Virginia. The list of authors can be seen in the page history. As with this Familypedia wiki, the content of Wikipedia is available under the Creative Commons License.